Fits all 37-50 inch Plasma and LCD TV displays or any TV with mounting hole spacing to 19 1/4" (489mm) vertically by 30 3/8" (770mm) horizontally. 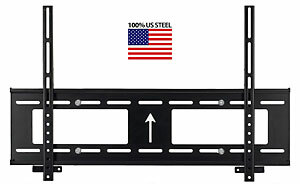 Percheron’s PMF700 ultra-slim flat mount is a North American made solution to mount your HDTV to almost any wall. The pmf 700 is laser cut 12 gauge 100% US steel, for a level of quality and precision the imports simply can’t match. Percheron’s pmf700 is powder coated for long term durability, with a 100% non-toxic, lead free finish.